After the last draft, I decided to take inventory and see what possible decks I could build for the eventual ladder climb. The goal for the end of the run is to hit Gold. I looked around for some budget decks, and settled on three possibilities. I ran a cost analysis to see how close I was to each one. Here are the results. This is almost the same exact decklist I used at the conclusion of the last F2P run. The difference is that I removed 3 Leyline Demons and put in 3 Grave Ghasts. This was not done for budget concerns – rather, the deck is simply better that way. Leyline Demon is weak in the current metagame since the nerf of Duskmaw, and Grave Ghast gives the zombie deck a great early game threat with its huge 5/7 stats (it got buffed during the rework). What’s interesting here is that if I go and scrap cards, I could build this Zombie deck right now. On Day 19. It took me 64 Days last time to build this deck, but with the new tournament structure and rewards, I can do it in 19! That’s great! I truly appreciate the combined Draft queue all the more because of this – keeping cards to allow quick collection and silver growth while still having decent prize payout as a player wins more and more. Doing an F2P run with Zombies again is boring. Zombies has no longevity. The deck will get to Gold, but it isn’t competitive enough right now to grind all the way up to Platinum or Titanium. It’s just too weak to the control decks. There’s very little you can do to improve on this decklist. I’d like to build an F2P deck where there is more of a progression you can take towards the deck as you acquire more cards. For instance, if you start with a budget Dinosaur deck, you can start with only Brons and probably do okay. Then gradually you can add Thundersaurs, Immortal Echoes, Uterradon Rex, and so on as you gain the cards. 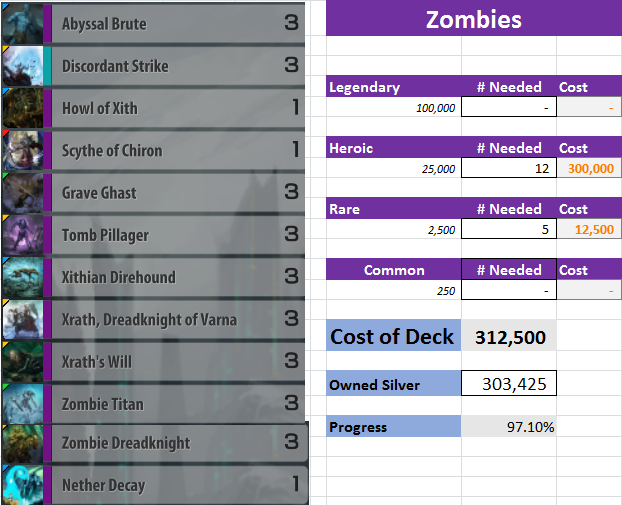 With Zombies, there aren’t actually that many cards you can add to it without fundamentally changing the deck somehow. So I’m not picking Zombies. Let’s move on to the next deck. This list is a budget version of the deck I was playing to Titanium on my main account, before the ladder reset as I was climbing up to Platinum V (grumble grumble). Anyway, it’s a Midrange Yeti deck with a strong emphasis on board control. It’s not a strong swarm or rushdown deck. Instead it has the distinction of being a flexible deck. With Firefist Uranti, Uranti Warlord, and Malice Hermit, the deck truly shines against other creature decks. This deck has two legendary cards that make it expensive – Living Hive and Malice Hermit. Malice Hermit is without a doubt necessary for this deck – he’s a Yeti, he gets absolutely gigantic, and helps a lot with board control. Initially I considered Living Hive more cute than good, but as I played with the card more and more, it really grew on me, especially in combination with Malice Hermit. It helps generate extra creatures and plays that can threaten the slower decks, as well as helps out a lot against Fiend decks when you need the extra chump blockers. Ultimately though, I decided not to build this deck. More for personal reasons than practical ones. I have already played a ton with this deck, and while I genuinely enjoy playing it and can finish building it faster the the following deck, I want to try something new. This is a weird control deck. You play board clear and removal like Epidemic, Firestorm, Death Current and so on to keep yourself alive. You win by casting Indomitable Fiend and killing it, then using Immortal Echoes, Undying Legacy, and Remembrance to keep summoning more and more Fiends, which get more and more massive as the game goes on. 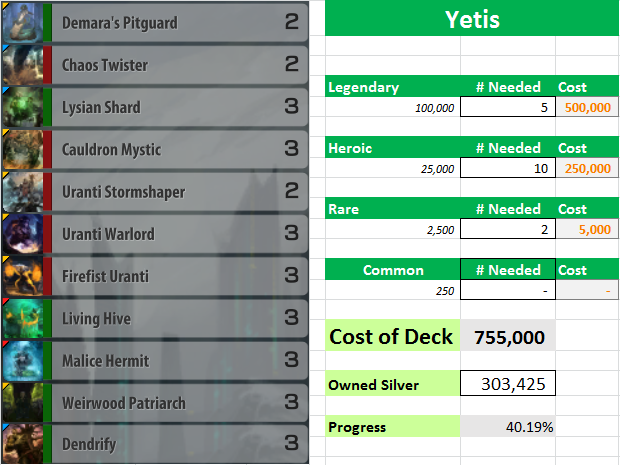 I am set on building this deck rather than the more affordable Yetis, because of one small reason: it is a budget control deck. That is a very rare thing. Most control decks rely on excellent and numerous legendaries like Chrogias, Othra, Ignir, Varna, Zimus, or Nova, as well as many other cards that help them drag the game out so they can play the powerful level 3s or 4s. But this one does not! This one has a simple yet powerful game plan. The deck is relatively straightforward to play, yet strong enough that you can take this list all the way to Titanium. It is also a good stepping stone to other control decks. You can shift it into a more burn focused deck by adding Ice Grasps, or a more aggressive Fiend deck by adding a different color – perhaps Uterra for Shardplate Behemoth. 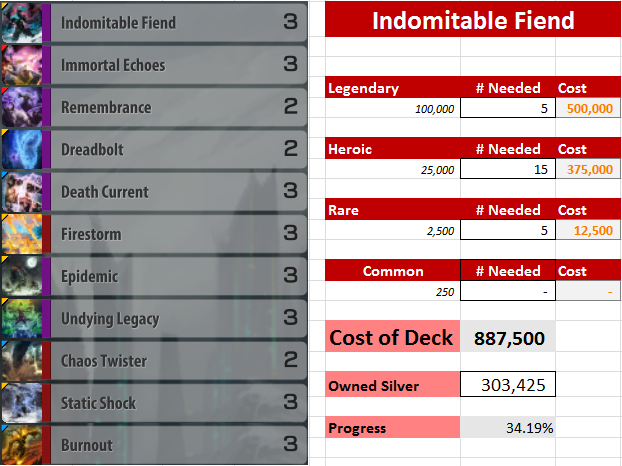 So I’m going for the Indomitable Fiend list. I’m about 34% of the way there now, so I imagine I can finish building it within the next two weeks, or less if I get lucky with pulls or the Guaranteed Legendary Draft. Another great blog Gard. Thanks for doing this. Just wanted to point out that cards from the new set cost double the forging cost so, for the time being, your forging costs may be a little off for those decks. The forging costs were reduced July 2nd, so thankfully this isn’t a concern. That would be explain why I’m seeing so many raid decks all of a sudden. I really do wish SBE was better about communicating these kinds of things in client. Hey Gard, did you look at the AN version of the Fiend deck, I’ve got both and I find it to have a bit more flexibility but maybe not the reach the NT version has. Gives you access to Edict, and Nanoswarm, I also use a mix of sonic pulse and palladium wave and a wipe clean for emergencies. The Tempys version is probably better and cheaper as Edict and Wipe are both legendary cards, just thought I’d mention it. I did! I don’t favor it over the Tempys version just due to how unreliable it is. Wipe doesn’t remove stats, Sonic Pulse doesn’t kill the creatures and they can be used again, and – most importantly! – you have no way to kill your own Fiends without resorting to cards like Soul Harvest or Grave Pact. I like Tempys more because it has the ability to kill its own fiends rather easily, with both Firestorm and Static Shock, and Burnout if you REALLY need to (and sometimes you do). The deck just isn’t very fun when the opponent plays around attacking into the fiend, which can delay the deck by many crucial turns. Though, Ambriel’s Edict and Wipe Away are Heroics, not Legendaries. When going against U it is often correct to kill your own fiend and ignore their early threats. You don’t want to get blown out by dendriify or botanimate and your removal can easily get you caught up on a behind board. No need to play your echos early. if you are going to get a no value echo it is almost always correct to level a removal instead. Play your overload early and often. A thin deck is a happy deck and you want to chain your echo later in the game. Thanks for the advice! I wish I had gotten it before today, when I just hit Gold minutes ago.